The first library director, Mr. Bradford Harrison III, was hired on April 1, 1961 and served as the director until July 5, 1961. 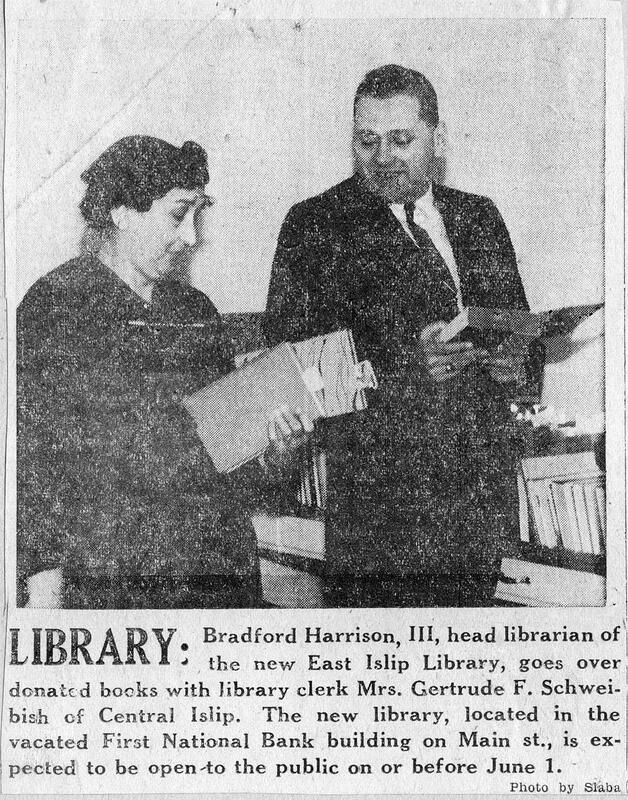 Gertrude Schweibish was appointed the Director of the East Islip Public Library under rather unusual circumstances. She had not completed her undergraduate studies nor was she enrolled in a Master of Library Science program. The Trustees, recognizing her potential, asked Gertrude if she would consider becoming the Director of the library. She agreed but the New York State Education Department said not until she had the necessary degrees for certification. After several appeals, the State agreed to waive her requirements provided she matriculated in a college for her Bachelor of Arts Degree. Remarkably, Gertrude was able to do both simultaneously and in addition she began her career as the temporary Director. From the very beginning, Gertrude realized the importance of making the library the central focal point of the community. In the small confines of the old bank opposite St. Mary’s church, Gertrude started a children’s “picture book time”, found room for a Reference Collection, and pursued enlarging the small circulating collection through donations. It wasn’t long before the trustees realized the need for a much larger facility. In 1967, the doors were opened to a new, spacious building. It was there that Gertrude was able to establish some very innovative programs. The “Picture Book Time” was expanded. The library was closed on Tuesday mornings except for the toddlers who were being read to in three groups, while the mothers gathered in the meeting room to hear guest speakers or to simply socialize. The program was extremely popular for young mothers who rarely had an opportunity to discuss the problems and joys of parenthood. Another unusual idea was to have local artists display their work. The library purchased one painting from each exhibitor. This then became the nucleolus of the lending art collection, and lead to what is now the Annual Juried Art Show that the library holds. Gertrude’s philosophy was to encourage the use of the library as much as possible. The door to her office was always open. She welcomed new ideas as well as constructive criticism. She had a talent for attracting unusual people to join the staff. The Children’s librarian, Dagmar Lange, was a wonderful storyteller and was known for her puppet making and her puppet shows that delighted the children. Another gentleman, Philip W. Leidy, who had written a book on government documents and was retired, was encouraged by Gertrude to become a reference librarian. He was responsible for having the East Islip Public Library designated as a Government Depository Library, with the vast number of publications being housed at the Suffolk Cooperative Library System. The exceptional record collection that the library had for many years was developed by a semi-retired musicologist. He too was discovered by Gertrude and encouraged to work every Saturday. Most of the collection was sold and the monies used to replace the records with CDs. Perhaps most importantly, she encouraged Ethel Urban to give her slide lectures on local history at the library for many years. Now Ethel’s pictures and commentaries are some of the only information we have left detailing the history of our local community. The library provided materials traditional to libraries at the time; books, magazines, LP records, 8 mm films, microfilm, microfiche and audio cassettes. The library showed 16 mm feature films and had typewriters available for the public. Gertrude seemed to have unlimited energy. Her concern for patrons was her first priority and she made every effort to ensure that all the materials needed were available to the public. She would have been extremely proud of the library becoming a community center that welcomes all. She served as director for 23 years. She retired in 1984 and passed away in 2005. Susan Heintzelman received her B. S. in Education, History and Political Science from Bowling Green State University, her Master of Education in Social Sciences and Educational Psychology from the University of Washington, and her Master of Science in Library Science from Drexel University. Before coming to the East Islip Public Library as Director she taught in Connecticut and Seattle, and was a librarian for the Aerospace Corporation in California, at Drexel University in Pennsylvania, at Chatham Public Library in New Jersey, and Library Director of the Wyckoff Public Library in New Jersey, as well as Assistant Director for Instructional Materials and the Media Center at the Milbank Memorial Library, Teachers College, at Columbia University in New York City. 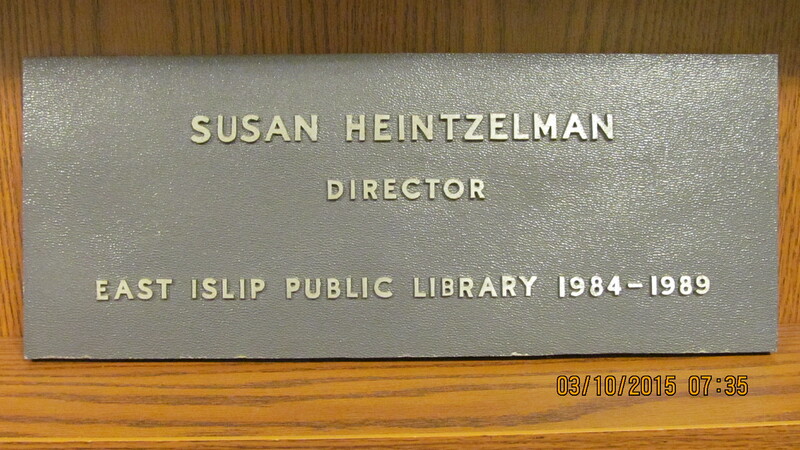 Mrs. Heintzelman’s impact on the East Islip Public Library was the introduction of online database searching, compact discs, and video cassettes. During much of her time as director, in addition to her administrative duties, she ordered part of the adult collection and catalogued the adult books and materials. She later added a full time cataloguer and Young Adult Specialist to the library staff. Mrs. Heintzelman left the library in March of 1989 to open Heintzelman’s Book Store with her husband Conrad in Los Altos, California. Appointed to the position as library director at the end of September, 1989, Mrs. Goode had previously been employed at the Sachem Public Library where she had worked for twenty years as the librarian in charge of adult and technical services. 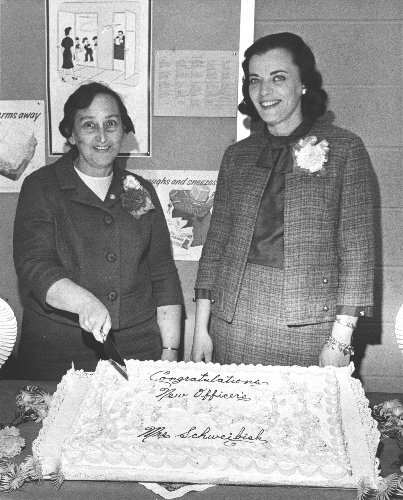 During her tenure as the East Islip Public Library Director, the library entered the computer age, adding the online public access catalog, the ability to search for periodicals online, and computers for staff and public use. She oversaw the implementation of several innovations, including the installation of a modern automated library system, the provision of Internet access for the public, and the use of e-mail. Mrs. Goode also expanded adult, young adult and children’s programming and services. Named Rotarian of the Year in 1992 by the Islip Rotary Club, Mrs. Goode dedicated much of her own time to community service. 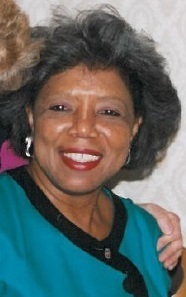 Mrs. Goode retired in 1997 and relocated to the Washington D.C. area. She passed away in 2012. Peter Ward was appointed to the position of Assistant Library Director of the East Islip Public Library in February 1997. Before coming to the East Islip Public Library in February, 1997 as Assistant Director, Mr. Ward worked at the Lindenhurst Memorial Library for eleven years, where he was in charge of public services. As Assistant Director at East Islip, he was responsible for the library’s technological development as well as other business management and public relations. When Clara Goode retired as Library Director, on September 26, 1997, Peter was appointed Library Director. Although his term as Director was short, his impact was strong in that he added technology equipment and a part-time computer technical consultant to the staff. He also assisted the Library Board in updating and revising the library’s policy and procedures. 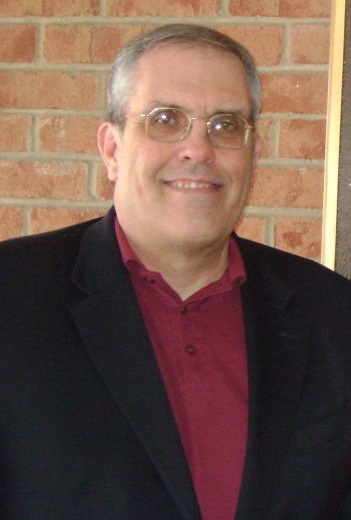 After leaving East Islip Public Library in October of 1998, Mr. Ward went on to become the Director of the Smithtown Library and the Lindenhurst Memorial Library. Guy Edwards received a B.A. in Geography from SUNY at Oneonta, NY, an MLS from the Palmer School of LIU, a Certificate in Human Resources from NYIT Westbury, and a Library Management Certificate from SUNY at Stony Brook. Before joining the East Islip Public Library in January 1999, he worked as a librarian at the Freeport Public Library and as the Assistant Director for the Long Beach Public Library. One of the first items of business for Mr. Edwards when he took over the helm was to begin to research the details for a library expansion. He scouted for the best location, spoke at community meetings, engaged an architect, instituted a Bond vote, hired a construction manager, filed plans with the New York State Dormitory authority and bid out the jobs. And, that was just the beginning! As the present director, Mr. Edwards continues to steer the library toward an ever more positive future.